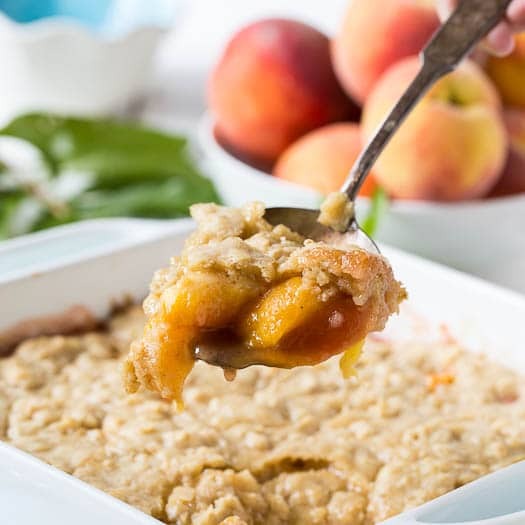 Cinnamon-Peach Bread Pudding made with a combination of refrigerated biscuits and cinnamon rolls is a summer dessert that’s bursting with peach flavor! It’s best served warm with a large scoop of vanilla ice cream. 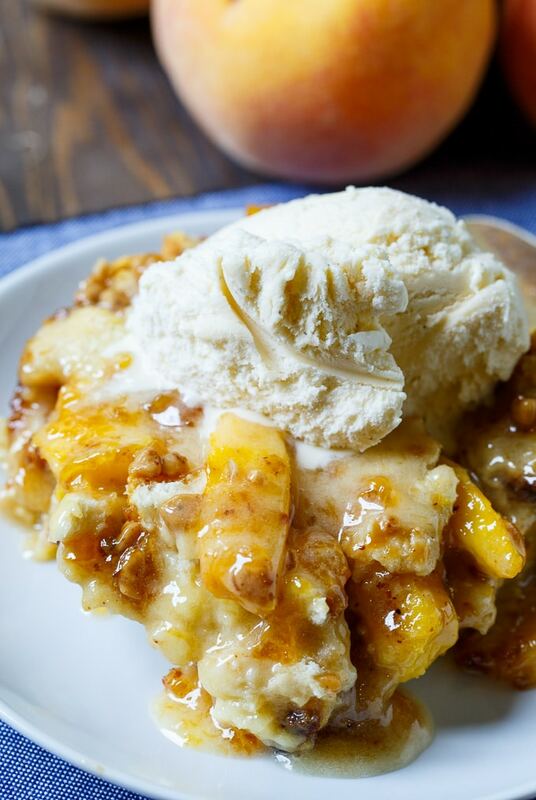 In addition to lots of cinnamon flavor, this bread pudding also has toffee bits and a marvelous glaze made from mixing peach preserves with the icing that comes with the cinnamon rolls. And there are so many different flavor combinations for bread pudding, the options are endless. I also love this Blueberry White Chocolate Bread Pudding with Amaretto Sauce. 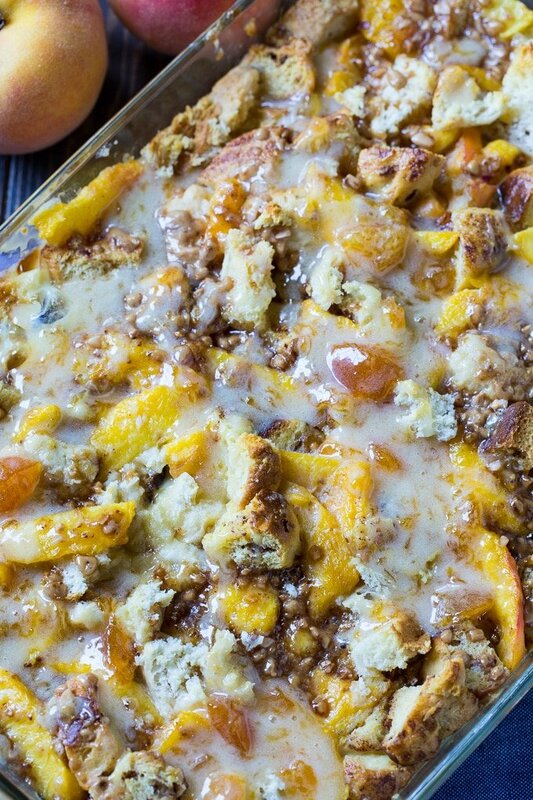 For a summer dessert, you can’t beat this Cinnamon Peach Bread Pudding. It’s so rich and sweet! 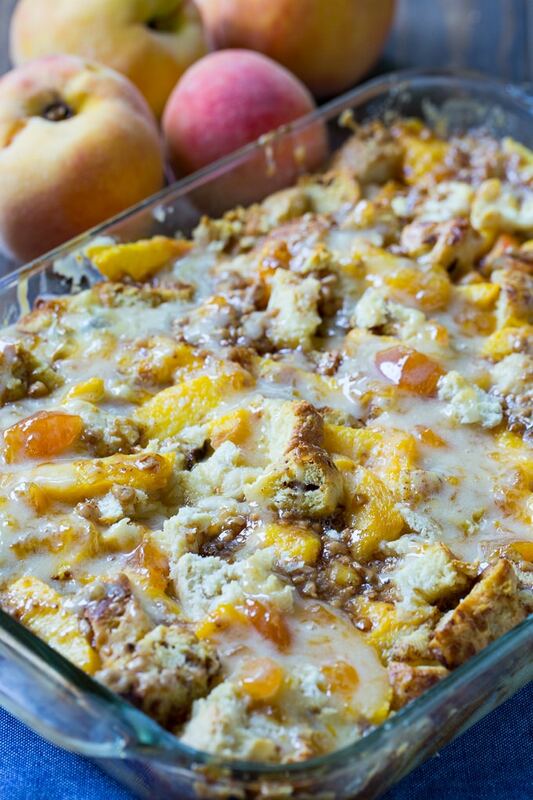 Cinnamon-Peach Bread Pudding is an amazingly delicious dessert to enjoy all summer long. Or all year long. Just substitute frozen or canned peaches if peaches aren’t in season. 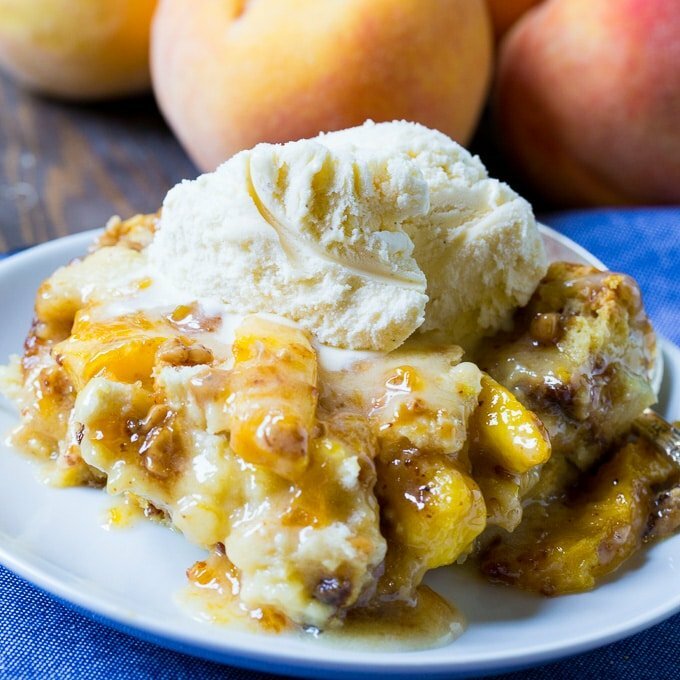 Cinnamon-Peach Bread Pudding made with a combination of refrigerated biscuits and cinnamon rolls is a summer dessert that's bursting with peach flavor! Bake cinnamon rolls and biscuits according to package directions. (Better to do in advance since bread pudding is meant to be made with stale bread. I bake them the night before.) Save the icing that comes with the cinnamon rolls. It will be used to make a glaze. Preheat oven to 325 degrees and butter a 9x13-inch pan. Cut biscuits and cinnamon rolls into 1-inch pieces and place in the prepared pan. 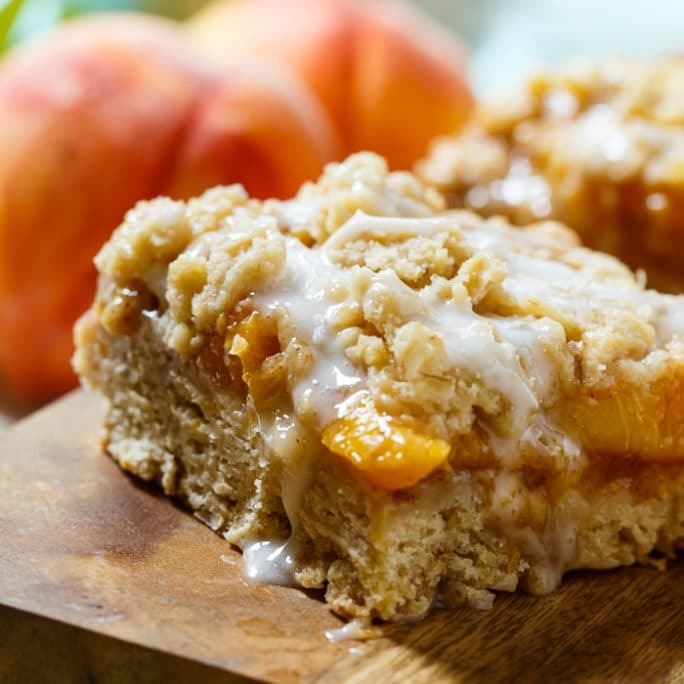 Toss peach slices with the 1/2 cup sugar and pour mixture over biscuit/cinnamon roll cubes. Toss gently to mix the peach slices in somewhat. In a medium bowl, whisk together condensed milk, half-and-half and eggs. Pour evenly over bread/peach mixture. Use a spatula to press everything down so that the pieces on top soak up the liquid. Bake uncovered for about 50 minutes or until set in the middle. In a small bowl, combine cinnamon roll icing and peach preserves. Microwave for 10 seconds. Stir and pour on top of bread pudding. Serve warm. This entry was posted in Desserts and tagged bread pudding, peaches. Bookmark the permalink.